Upstairs is a bathroom plus three bedrooms, an en suite double with king size bed & wall mounted TV, a twin and a single. 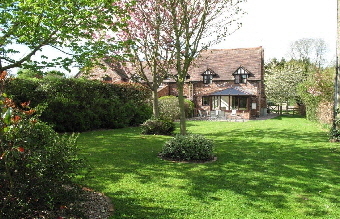 To the rear of the cottage, adjoining the conservatory, is a patio with furniture and gas barbecue. The private rear garden has a large lawn and is shrubbed on the one side with a beech hedge on the other. It is fenced all round making it totally secure. The cottage has its own driveway with off-road parking for two cars. Internally it is very similar to Threshers. 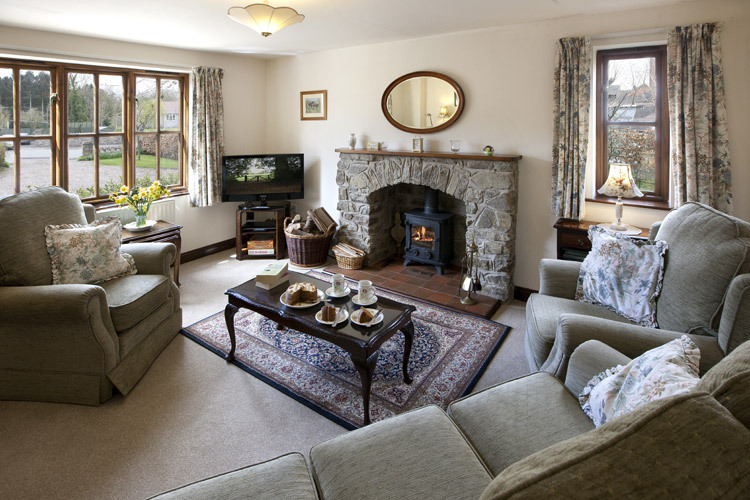 The lounge is very cosy with a woodburning stove and 32” TV. Off the hall is a ground floor cloakroom with loo and washbasin. The large kitchen/diner leads via french doors to the conservatory. With wifi internet access. Coming back Ashford Farm is as nice a pleasure as ever. Also stayed in Well Meadow and Old Bull Pen. Such a warm welcome from Norman & Lynda. Our favourite place. 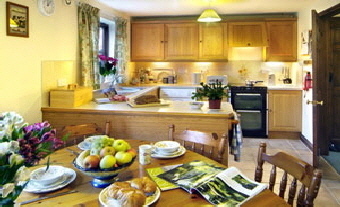 Excellent holiday cottages, very warm and comfortable. Lovely area to explore and the dogs enjoyed the walks. Very friendly village and we enjoyed the delicious cake and welcome basket. Thank you to Norman & Lynda for their warm welcome too. Another relaxing week in this excellent cottage. The dogs loved the enclosed gardens and we can watch them running up & down from the conservatory. We will return again soon. A delightful week - Grazers seems to have everything one could want. It makes a super peaceful base for pottering in the area. “Welcome cake” was delicious! Cottage and warmth of welcome of the highest order. Can’t wait to come again. First time to Ashford Farm and thoroughly enjoyed our stay. Thanks for providing a well equipped warm and comfy cottage. Lovely comfortable cottage and beautiful surroundings. Thanks you very much for the welcome basket and cake which was very tasty. It was good to return to Ashford Farm. 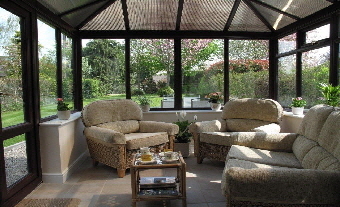 We loved sitting in the conservatory too with beautiful garden view. Totally lost count of how many times we have been to Ashford Farm Cottages, whatever it is nothing changes, absolutely brilliant! Lovely to return here for such a comfortable week. Particularly enjoyed the new places, Hampton Court Gardens (map in cottage) & Gigrin Farm Rhayader, red kites - spectacular. Thank you once again for a lovely restful stay - charged batteries ready to go again. Excellent cottage, everything one could need. A lovely area to explore. Powis Castle is a must. Hope to be back next year. Lovely holiday. See you next year. The perfect base to explore England’s ‘green and pleasant land’. A glorious week of sunshine and sightseeing - couldn’t have asked for more! We all enjoyed Ashford Farm at different times during the last 2 weeks. The children loved the horses and sheep and exploring the nearby castles and playgrounds. 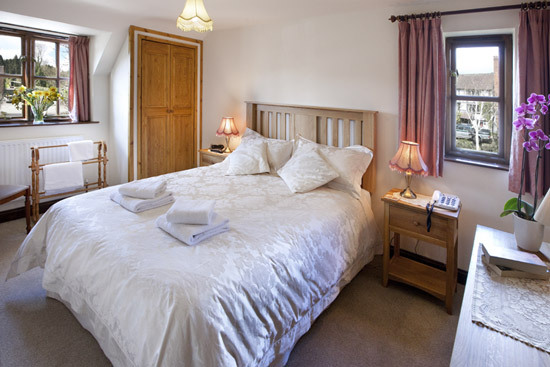 Lovely stay, enjoyed the cottages, Shropshire countryside, walks & visits to historic sites. Thank you.